Welcome to Stop 32 and Chapter 32 of the CONSEQUENCES audioBOOK blogTOUR! 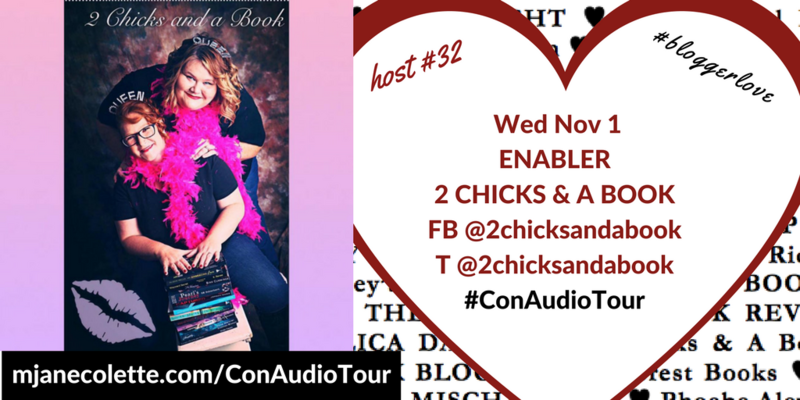 If you’re in a hurry to listen to Chapter 32: ENABLER, hurry over to 2 CHICKS & A BOOK Facebook Blog RIGHT NOW! Me: Run run to 2 CHICKS & A BOOK to find out! Still here? Good. Cause gratitude is important and I am so grateful to each of the fabulous people hosting the Consequences Audio Tour, and I hope you’re enjoying meeting them. Stop 32 (and Chapter 32) are hosted by 2 Chicks & A Book—self-proclaimed book whores—also reviewers and beta readers. 2 Chicks & A Book (it really should be 2 Chicks & many, many, many books, so many books they are TAKING OVER EVERYTHING) read and love all sorts of romance stuff, with a particular penchant for Erotica, RomCom, Alpha, Romance, HEA, & Friends to Lovers elements. Their FB page is very vibrant and engaged, and their GoodReads reviews killer. Check them out! I am thrilled 2 Chicks & A Book accepted my invitation to be part of the Consequences Audio Tour, and I hope her readers enjoy the revelatory ENABLER chapter. Now you–get thee to Facebook and listen to Chapter 32: ENABLER.